Bamfield, on the west coast of Vancouver Island, is the most beautiful place in the world, both above and below the tideline. Every year, I spend three blissful weeks there, teaching undergraduates at the Bamfield Marine Sciences Centre. This year, it was Sc ientific Diving – how to collect data underwater. My co-instructor Siobhan and I had 9 keen students who, after 10 days of training, were ready to dive into personal research projects. Our class focus was figuring out the interactions between sunflower stars (the largest seastar species in the world), leather stars and green sea urchins. Sunflower stars were decimated by a disease last fall all around Vancouver, but they were untouched around Bamfield. This seemed like a great opportunity to understand the connections between this major predator and their potential prey in an intact ecosystem. Two of our students, Beau and Tella, elected to survey seastars and urchins at several locations to document normal patterns of abundance. It’s tedious work to run, day after day, one transect after another and to count each animal that falls close to the measuring tape laid down as a guide. But they did it, carefully recording what was there, until one of the transects at Aguilar Point yielded something different: a digital camera. Tella slipped it in her pocket and carried on counting seastars and urchins. Back at the dock, after the dive, Siobhan and I were quite excited by this find. 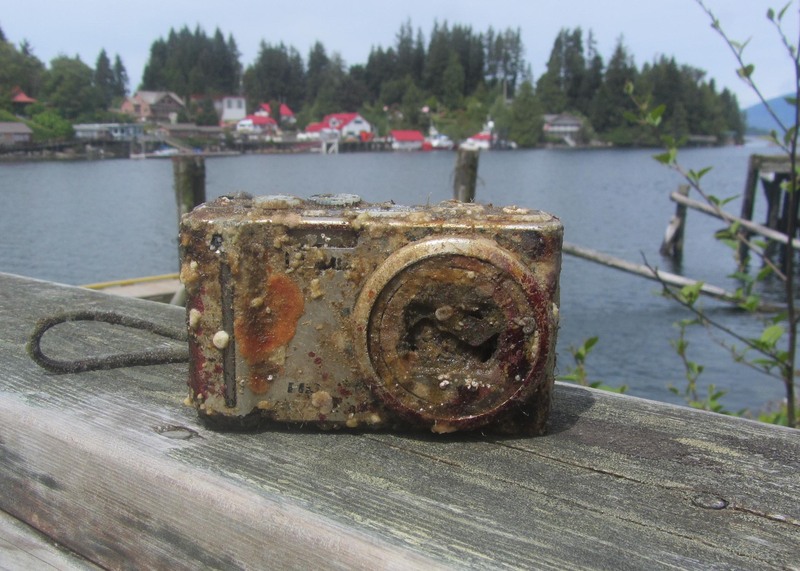 The camera had obviously spent some time in the water: it was covered with encrusting seaweeds and barnacles. A small brittlestar had taken shelter under the viewfinder, as had a large worm with bristly legs, some blob-like sponges, a couple of little clams and a tiny shrimp. A complete marine microcosm. After we posted one of the recovered photos online and around Bamfield, one of the smiling faces was recognised as a man who had been rescued by the Coast Guard, two years earlier. It was a harrowing night for Paul B, a Vancouver artist, when his boat ran aground on the rocks and quickly sank near Aguilar Point . He swam ashore, clinging to the cliff face for dear life, shouting to attract attention. He was eventually heard, six hours later, and the Coast Guard came from just around the corner to help him to safety. Meanwhile, his camera had settled between two boulders, 9 m below the surface, soon to attract seaweed sporelings and other marine life. It would be a long wait until Beau and Tella came along. PS Paul B and his lost memory card have now been reunited. This story took a life of its own a couple of weeks after the discovery of the camera. It got picked up by CBC, BBC, ABC, FoxNews, Huffington Post, and ultimately CNN! You can read about it here, hear about it here or watch it here.